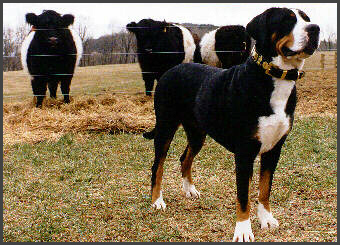 Of all the herd dogs in Switzerland, the Greater Swiss Mountain Dog is undoubtedly the most commanding. He is much appreciated for his incomparable abilities. As a drover of cows, he dominates his charges completely, always keeping the herd in order and in the right territory. In addition, he is an exceptional guard of the cowshed and a prized protector of his master's house and property. He seldom rests, sleeping at night with one eye open. From: `The Great Book of Dogs' by Gino Pugnetti and illustrated by Pietro Cozzaglio. It is the largest of the four Sennenhunde. Females weigh between 90-115, 23-27 inches tall, males 110-135lbs., 25-29 inches . They were originally bred for watch and draught work. The breeds heritage comes from a time when things were much simpler. Tradesmen and farmers used dogs to help in everyday tasks. The Swissy pulled carts to and from market. They drove, herded cattle, and protected the homestead. Today they are good companion and family dogs, as well. In the 70's the breed found its way to Pennsylvania, and one of its first stops was Berks County, and the Summons' farm near Reading. 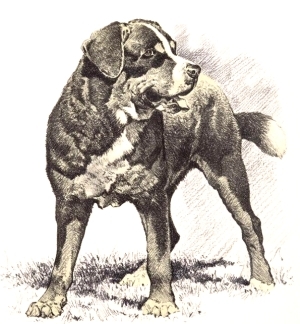 The late Dr. Summons and his wife Gretel were instrumental with the breeds start in America. Fortunately growing up in Berks County I was able to meet many Swissies and Breeders. With out doubt the Swiss Farmers developed an outstanding multipurpose dog today's "Swissy". CH. Elsa Von Wmelsdorf American Born and Bred! Elsa was my first home raised and bred champion. It was with her and her brother "Buster" Wilhelm von Wmelsdorf that I got involved in showing Swissies. It has proven to a fun past time and an opportunity to mingle with other aficionados of the breed. If you would like to see more old pictures of dogs pulling carts in Europe use the link below.